Hello Lodi! If you want to floss regularly but are too tired at night, this post is for you. In our The Lodi Dentist blog, we want to give you a few ideas for unique times to floss and keep your teeth and gums healthy. 1. If you’re an early riser, try flossing in the morning right after you brush. 2. Try just after lunch, but before you go back to work. 3. Before or after you exercise. Your oral health is just as important as your physical fitness. Keep some floss in your gym bag and give your teeth and gums some attention along with the rest of your body. 4. During the nightly news. 5. While taking a bath. Any task is more enjoyable if it can be done while relaxing in a warm tub. Light some scented candles, play some soothing music and turn off your cell phone for an at-home spa experience. 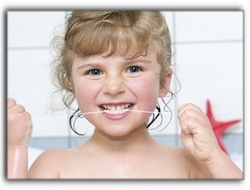 Flossing is essential for anyone in Lodi who wants to have a healthy smile. I hope this gives you some ideas to help you make flossing part of your daily routine. Just before bedtime, however, is still the best choice. Food particles left on teeth can turn to plaque while you sleep. The bacteria in plaque erodes enamel, creates cavities, and adversely affects gum tissue. If you want to improve your smile, look into cosmetic dentistry procedures such as teeth whitening, invisible braces or porcelain veneers. We are Drs. Neal and Hoff. Our practice is located in Lodi. Helping our dental patients establish good habits is important to us, as well as helping them achieve the smile they want with cosmetic dentistry procedures such as veneers, porcelain crowns, and complete smile makeovers. We are currently accepting new patients, so give us a call at (209) 269-8259 to make an appointment! Can You Name 9 Dental Specialties? Voted Best Dentist in Lodi for the 7th year in a row! Dr. David A. Neal, D.D.S. Dr. Mary E. Hoff, D.D.S.